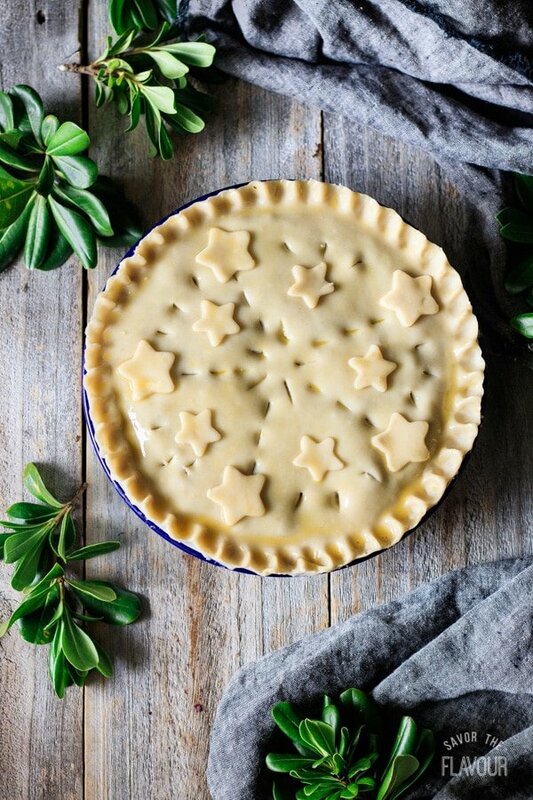 French Canadian meat pie, called tourtière in French, is a delicious savory pie served on Christmas Eve in Quebec. 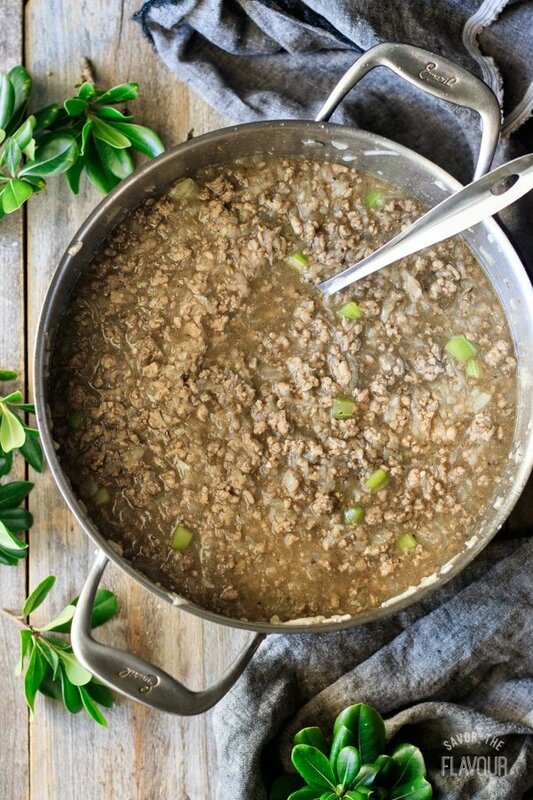 Ground beef and pork are cooked with onions, potato, celery, beef stock, and lots of aromatic spices to give this dish lots of flavor. You family will love this main dish served with mashed potatoes, ketchup, or HP sauce. It’s a keeper! This post was originally published on March 2, 2018. When I was growing up, our family enjoyed eating tourtière for supper occasionally. There was something delicious about its simple, yet flavorful filling and flaky golden pastry. I always looked forward to eating this pie! 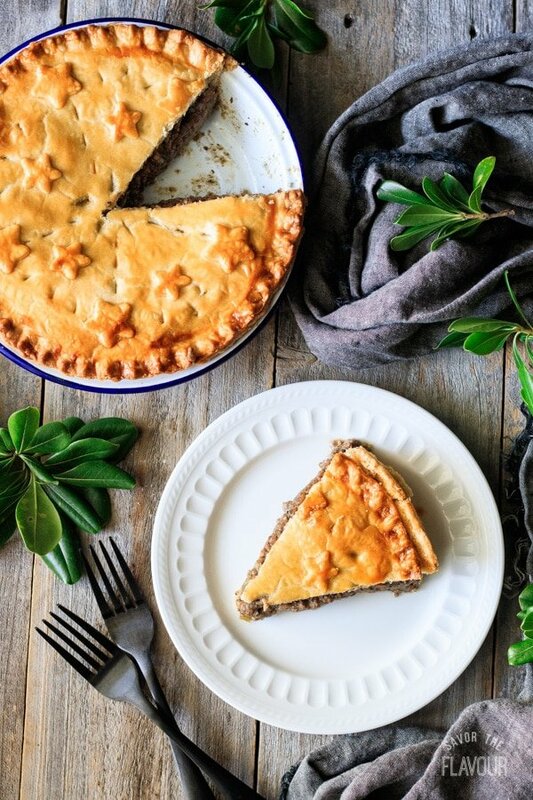 Did you know that tourtière originated in the Canadian province of Quebec? It is a traditional meat pie that varies widely from area to area, and is often served on Christmas Eve in French Canadian households. 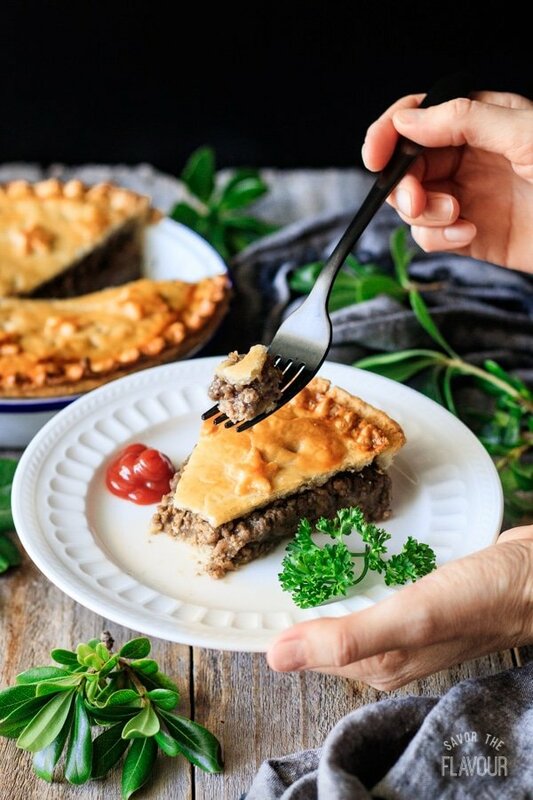 Many tourtière recipes call for both ground pork and ground beef, and some even include game meats to provide more variety. Some people use mashed potatoes in the filling, while others say to use grated potatoes. I’ve opted for a mixture of ground pork and beef with grated potatoes. 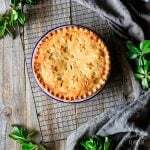 What spices are in tourtière? 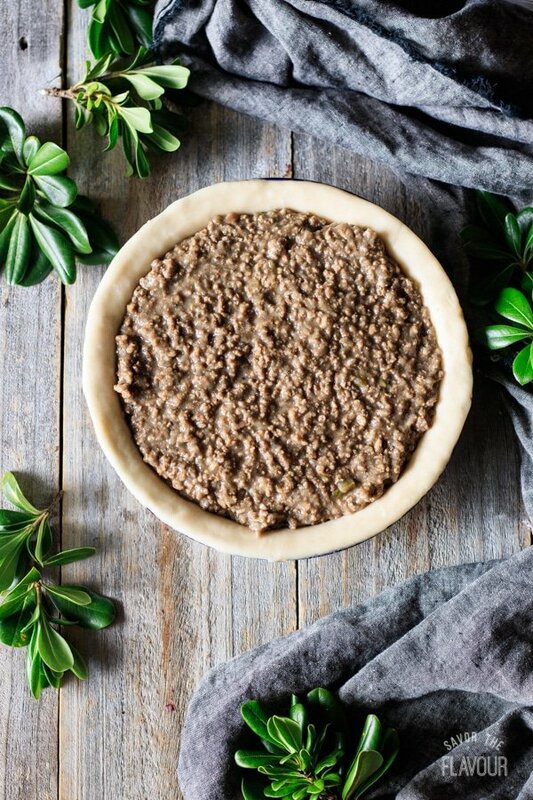 There are countless variations of tourtière, but most versions contain spices like pepper, salt, cinnamon, nutmeg, and cloves. Some like to add a touch of cayenne pepper for a little heat. What temperature do you bake tourtière? Since the meat filling is already cooked, we just need to cook the pastry in the oven. I like to bake tourtière at 400 F, which browns the flaky pastry nicely. How do you reheat a French meat pie? Bake at 400 F for 10-15 minutes, until warm. 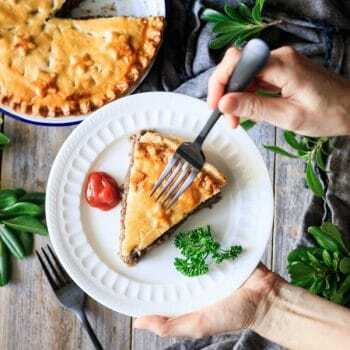 To reheat a frozen meat pie, thaw in the fridge overnight (about 8 hours), then bake at 400 F for 10-15 minutes, until warm. 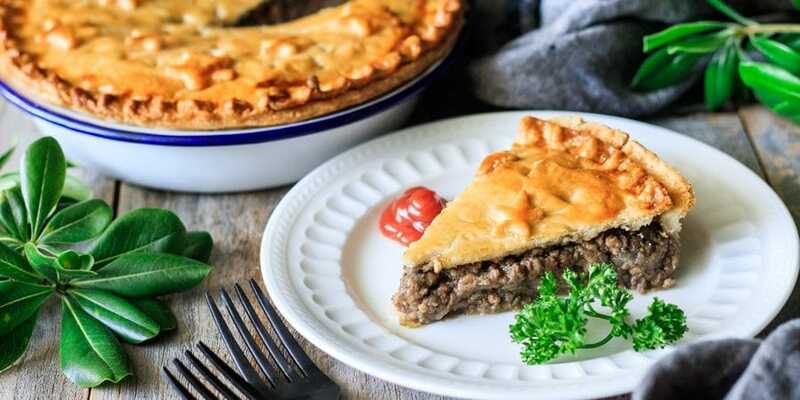 How do you make a French tourtière? 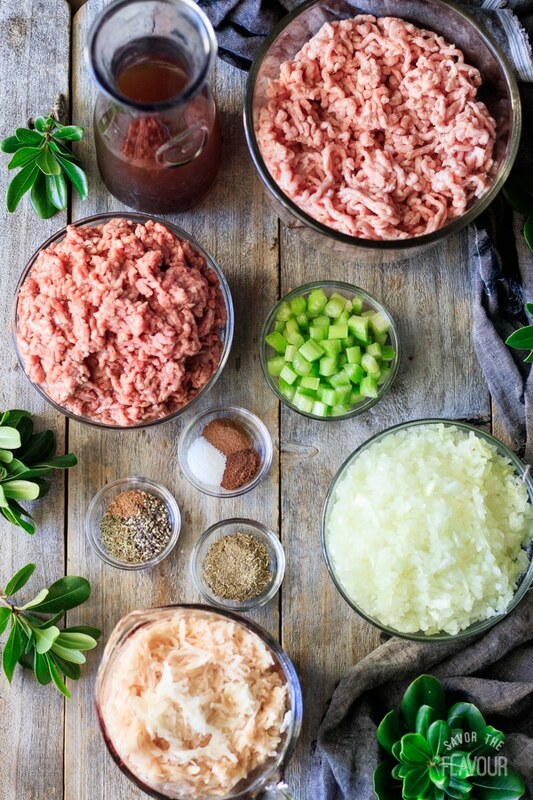 Start by gathering the ingredients: ground beef and ground pork, onions, celery, grated potatoes, beef broth, and spices. Brown the meats in a large Dutch oven over medium-high heat. Boil off the excess fat. Add the onions, celery, beef broth, spices, and grated potato. If it’s still too thick, add additional beef broth or water, but be careful not to add too much, as it will increase the cooking time. Simmer on low for 30 minutes, then taste and adjust seasonings as desired. Simmer for another 30 minutes, until most of the liquid has evaporated and the filling is thick and moist. Let the filling cool in a shallow dish until it’s no longer hot because it will melt the butter in the pastry and you’ll have a greasy mess. 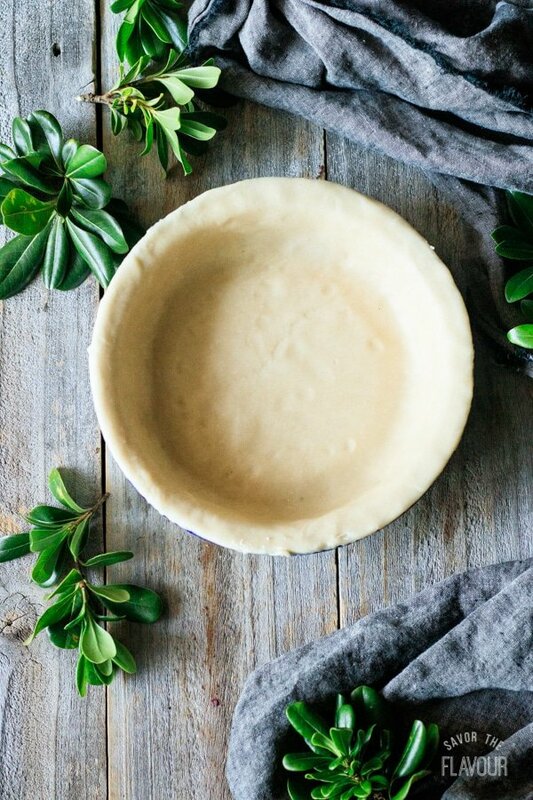 Preheat the oven to 400 F and line a 9-inch, deep dish pie plate with pastry. If you’re short on time, or don’t want the extra calories, just omit the bottom crust. 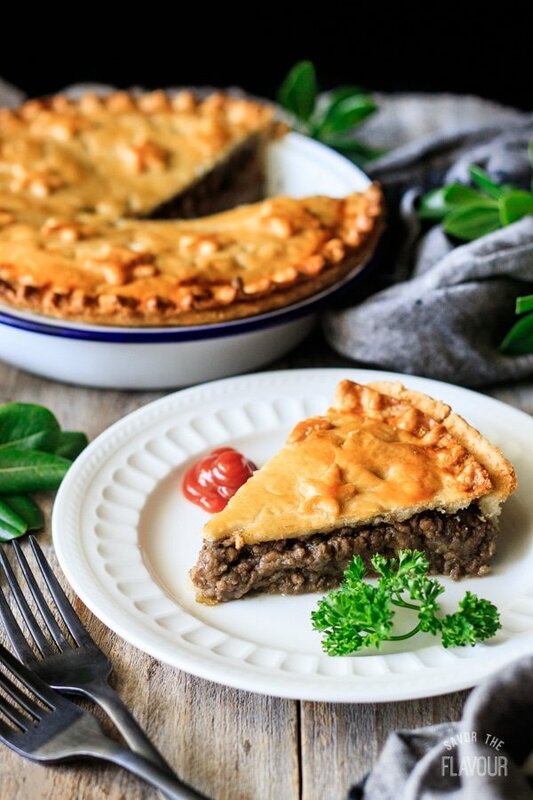 Click here to find out how to make a meat pie without a bottom crust. Add the cooled filling to the pie plate. Brush the edges of the pie with beaten egg, then top with the remaining pastry and cut off the excess. Brush the whole top with beaten egg, cut a few vent holes, and decorate with the pastry scraps as desired. Bake at 400 F for about 40 minutes, or until the pastry is a rich golden brown. Let the pie cool for about 30 minutes to allow the filling to set, then slice and serve hot with ketchup. 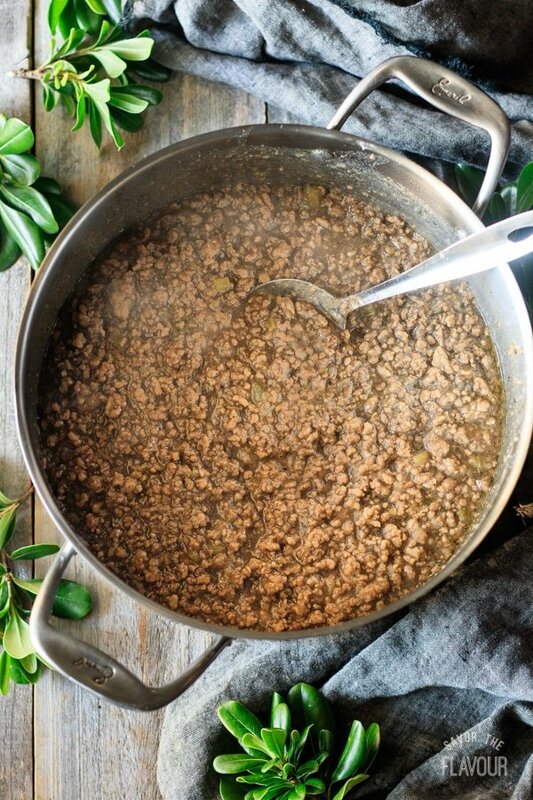 Use at least two kinds of meat for a variety of flavors. Make sure the meat isn’t too lean; 80% lean to 20% fat is a good ratio. A low fat content will make the pie dry and bland. Simmer the filling uncovered for the last 30 minutes to help the extra moisture evaporate. Keep the filling on low heat so the meat doesn’t stick to the bottom of the pot. Taste and adjust seasonings as the filling cooks for the best results. Let the meat filling cool for a while at room temperature before putting it in the pastry, or it may melt the butter in the pastry. Store leftover tourtière tightly covered in the fridge for up to a week. 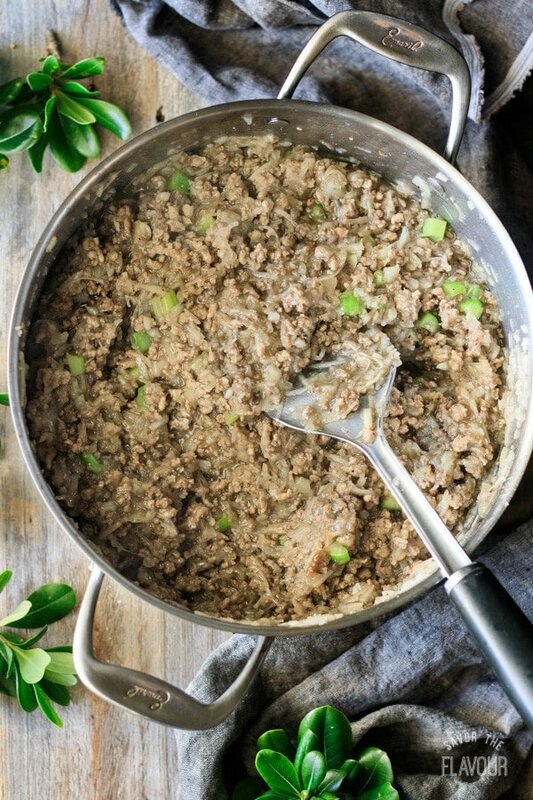 Freeze leftover tourtière for up to 3 months. Defrost in the fridge overnight, then reheat in the oven or microwave. Warm up from the inside out with these other meat pies. 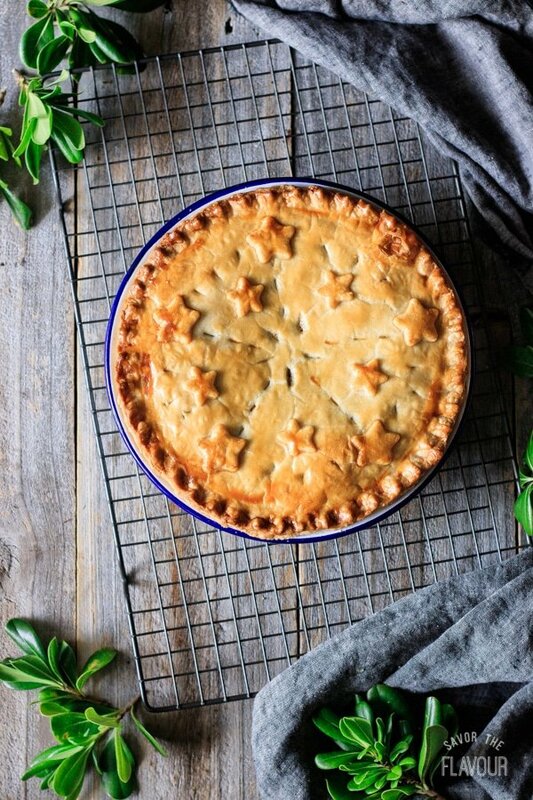 Minced Beef Pie: buttery puff pastry and a juicy meat filling make this pie a family favorite. 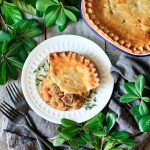 Leftover Ham and Cabbage Pie: a nutritious comfort food dinner made with smoked ham, cabbage, and creamy gravy. Chunky Beef and Potato Pie: a hearty beef and vegetable stew topped with crisp golden pastry. 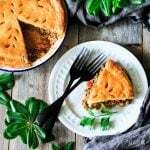 Have you made this tourtière? Please leave a star rating below the recipe to share how you enjoyed it! 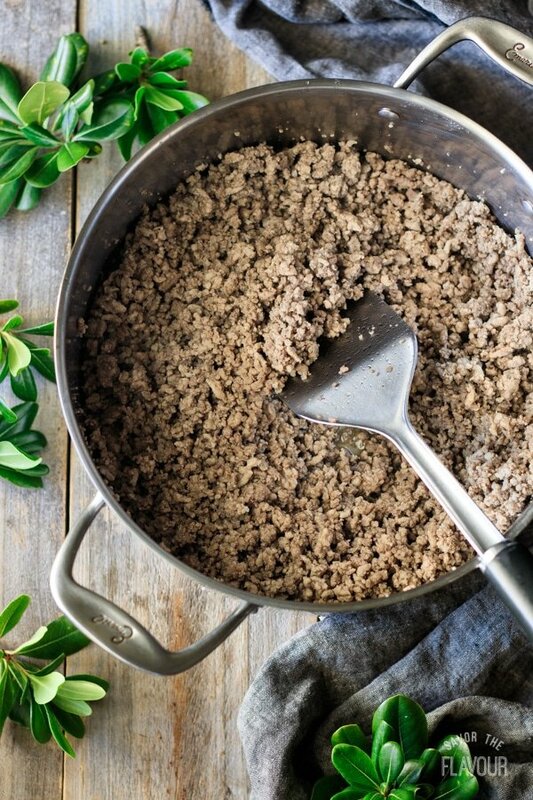 Brown the ground pork and ground beef in a large Dutch oven over medium-high heat. Break up any clumps with a heavy metal flipper, and continue cooking the meat until almost all of the fat has boiled off. While the meat is cooking, finely chop the onions and celery. Turn the heat to medium and add the onions, celery, beef broth, and spices. Peel and grate the potatoes and stir them into the mixture right away or they will turn a pinkish gray color. Cover the pot and simmer over low heat for 30 minutes. Remove the lid and stir, adjusting the seasonings as desired. Simmer for another 30 minutes, uncovered, until almost all of the liquid has evaporated. The filling should be thick and moist. Spoon the mixture into a large, shallow dish and allow the filling to cool to room temperature on the counter, about 1 to 1 1/2 hours. Preheat the oven to 400 F. Beat one large egg in a small bowl. Once the pastry has chilled and the filling has cooled, roll out the pastry on a lightly floured surface to about 1/8 inch thick. Use it to line a 9-inch, deep-dish pie plate. Spoon all the filling into the pastry-lined pie plate. Brush the lip of the pie with beaten egg. Re-roll the remaining pastry and use it cover the pie, pressing down the edges to seal and trimming off excess pastry with a knife. Crimp the edges with a fork, then brush the whole pie with beaten egg. Cut a few vent holes in the lid and decorate with pastry scraps as desired. Bake at 400 F for about 40-50 minutes, until the pastry is evenly browned. Cover the edge of the crust with aluminum foil if it’s getting too dark. Let the pie cool on a wire rack about 30 minutes before serving, as the filling needs time to cool and set before slicing. 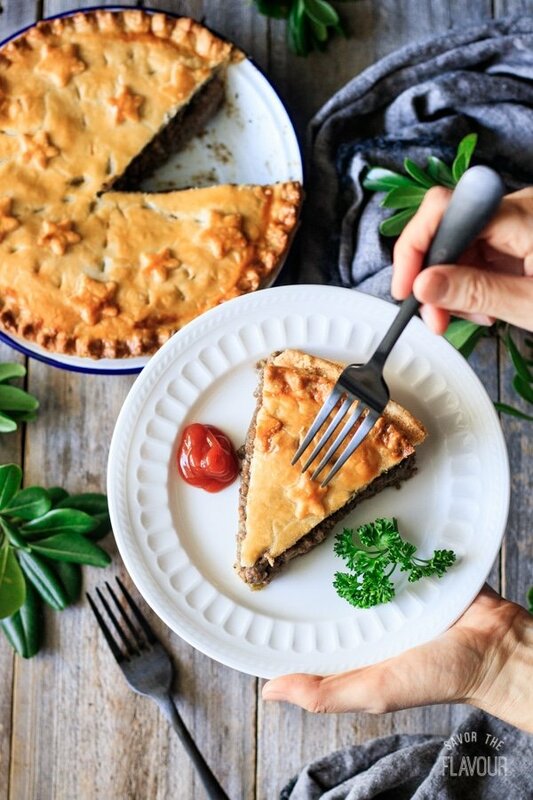 Serve the pie hot with tomato ketchup or HP sauce. Leftover tourtière freezes very well in a zip-top freezer bag. Defrost overnight in the fridge, then reheat in the oven at 400 F or in the microwave.